How can the largest university in Dallas-Fort Worth, Texas, lead the pack in sustainability? Build a green football stadium, of course. The University of North Texas (UNT), whose main college grounds are located in Denton, Texas, recently added a new facility to its campus aesthetic and to the green building movement. UNT unveiled Apogee Stadium, named after the campus’ network access provider, Apogee, in August 2011; nearly two years and $78 million after contractors, Manhattan Construction Group, first broke ground. The university is giving new meaning to its moniker “Mean Green.” According to school history, the whole “Mean Green” nickname was born in the late 1960s thanks to the athletics department’s “Mean Green Defensive Unit.” Lest, we forget all-pro American football hall-of-famer and university alumna, “Mean” Joe Greene. However, recently, the school’s nickname has evolved along with the sustainability movement. UNT is using all of its financial resources to plug money right back into campus improvements – green improvements. 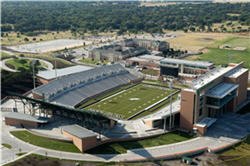 The new 30,000 seat stadium serves as the center point for the university’s new UNT Mean Green Village. The stadium spans 46 acres of land, features an 85,000 square feet water retention system, 338,000 square feet of paver, native landscaping, ornamental perimeter fencing and a total of 1,758 parking spaces adjacent to the stadium. “This state-of-the-art venue will give fans the opportunity to bond through Mean Green pride and to carry on the traditions that have been woven into the fabric of our local communities,” said UNT President V. Lane Rawlins in a press release. In April 2011, the university received a $2 million grant from the Texas State Energy Conservation Office to install three wind turbines responsible for feeding the electrical grid that provides power to Apogee Stadium – along with surrounding buildings in Mean Green Village. The wind turbines are not yet powering electricity for the buildings, but are scheduled to be up and running by mid-December. The turbines will offset energy consumption in the stadium and neighboring buildings by roughly six percent and eliminate 323 metric tons of annually emitted carbon dioxide. The university has been making waves in the eco-friendly arena by implementing green initiatives. In 2008, former UNT President Gretchen Bataille, signed the American College and University President’s Climate Commitment, dedicated to carbon neutral initiatives. The Denton-based school was one of more than 600 private and public institutions to sign the commitment to offset climate change. Since the pledge toward countering harmful environmental effects three years ago, the school was recently recognized for its sustainable efforts and scored high ranks on The Princeton Review’s annual list of environmentally responsible universities, in partnership with the USGBC. In May 2011, UNT made the “Green College” list of eco-friendly schools – one of only three from Texas to make the cut. Schools are rated on a scale of 60 to 99 and those with a score of 80 or above are featured in the 2011 edition of the “Green College” list – UNT scored a 95. Watch the evolution of Apogee Stadium below.